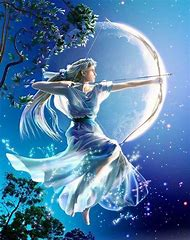 Diana is the goddess of the moon and hunting. Diana has a love for wolves and other dark creatures. Diana is a Roman goddess and it is believed that her sacred animal is a deer but she loves wolves too !